The science of yoga offers us specific direction in how to uplift our consciousness and express dharma in our service of others. What is our dharma? 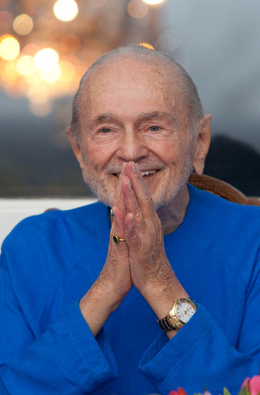 Swami Kriyananda once said that if something is right in front of you to be done, usually it is your dharma to do it. We need to embrace every circumstance that comes to us as exactly what is needed for our spiritual growth. And, in yoga we learn that what we do is much less important than the spirit in which we do it. Recently, I had lunch with a young woman at a crossroads. She had accomplished much: a Master’s degree in a her field, a meaningful career helping people in need, and by all accounts a successful life in an affluent community. Although she wasn’t miserable, she deeply felt she needed something more. We spoke about the need to follow one’s dharma, but also the need to for inner growth and fulfillment through yoga and meditation. We agreed that the fundamental focus of life must be dual: personal growth as well as service to others. Swami Kriyananda embodied this principle, in spirit and very much in life. He said, “I have had only two desires in my life: to find God and share Him with others.” Our guru, Yogananda, similarly emphasized the need for a balanced, but intensive practice of both meditation and service. Fundamentally this is key to the destruction of suffering, and the attainment of true happiness. But how to do it? The solution is simultaneously simple and difficult: to be rid of ego, and worship God. Put another way, we must overcome everything we think we know and want, everything we think we are, and be open to higher truth everywhere. Another person recently shared with me her sincere desire to give money to a good cause. She said her family, although wealthy, would not give her the money because they thought her to be too generous and giving. Although her motive was pure, she forgot God and let circumstances beyond her control drive her to attitudes of ego: judgement and unhappiness. While she insisted she was not coming from her ego, I assured her: it’s always the ego! I know from my own experience! Gradually as yogis we begin to recognize and release the snares of ego and embrace God in every circumstance. Coupled with our dedicated, sincere efforts to know God in daily yoga and meditation practice, we find divine peace and divine joy everywhere. A testam ent to dedicated yoga practice and selfless service, Ananda Yoga Teacher Training, our 28-day course, is underway here at The Expanding Light. Although I have participated in many of these intensive trainings, every single course and each student has continued to inspire me with deeper dedication to grow spiritually, and the sincere desire to help others. It’s at the very heart of all life: the destruction of suffering, and the attainment of happiness through dharma. This entry was posted in Superconscious Living, Yoga, Yoga Teacher Training. Bookmark the permalink.